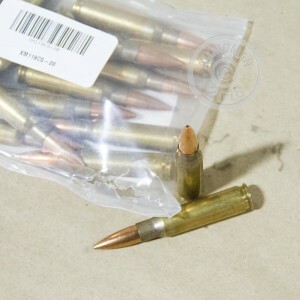 Are you looking for some high quality NATO 7.62x51mm ammunition? These rounds from Lake City are a great offering of MIL-SPEC cartridges. 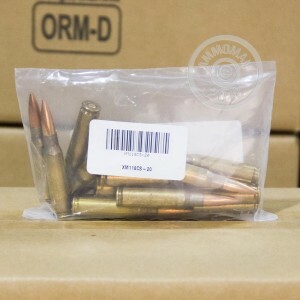 These 7.62 rounds are loaded into new production brass cases that are boxer primed and re-loadable. Each projectile in this loose packed bag of 20 is a 175 grain Sierra MatchKing open tip match that is designed to deliver exceptional accuracy and consistency. Lake City loads these rounds to the M118 designation for long distance shooting. Lake City is responsible for manufacturing ammunition for our military as well as for civilian use. Located in Independence, Missouri, the Lake City Army Ammunition Plant is the regional and national NATO testing facility for small caliber ammunition as well as stockpile reliability. Need more than 20 rounds? At AmmoMan.com, if you order $99 we will ship your order for free! So stock up and save!